The double pack for plant aquariums is recommended for plant growth, and to prevent algae growth. See below for the best deal on Dennerle Trocal de Luxe T8 Special Plant DUO. Big Savings on Dennerle Trocal de Luxe T8 Special Plant DUO! The double pack for plant aquariums is recommended for plant growth, and to prevent algae growth. Creates a warm, particularly pleasant light environment. Creates a warm, particularly pleasant light environment DE LUXE light quality Colour index: EXCELLENT Special spectrum prevents algae growth State-of-the-art lamp technology - New generation - ALON-C Longlife technology Extra long life: over 15,000 operating hours With TROCAL Color Peaks: Fish glow in their most beautiful colours - ideal light for plant growth Light spectrum adapted to aquarium plants with algae gaps Activates chlorophyll synthesis When mixed light colours apply, TROCAL Special Plant always improves the light spectrum in the direction of good plant growth Tests reveal a reduced susceptibility to the formation of floating leaves from Echinodorus sword plant, tiger lotus, Sagittarias High luminous efficiency = lower electricity costs. A 30 W TROCAL Special Plant has a light output of 2400 lumen Fits all standard aquarium lights Operation possible with all conventional and electronic ballasts Can be combined with all TROCAL light colours Whats this? The double pack for plant aquariums is recommended for plant growth, and to prevent algae growth. Cr.. 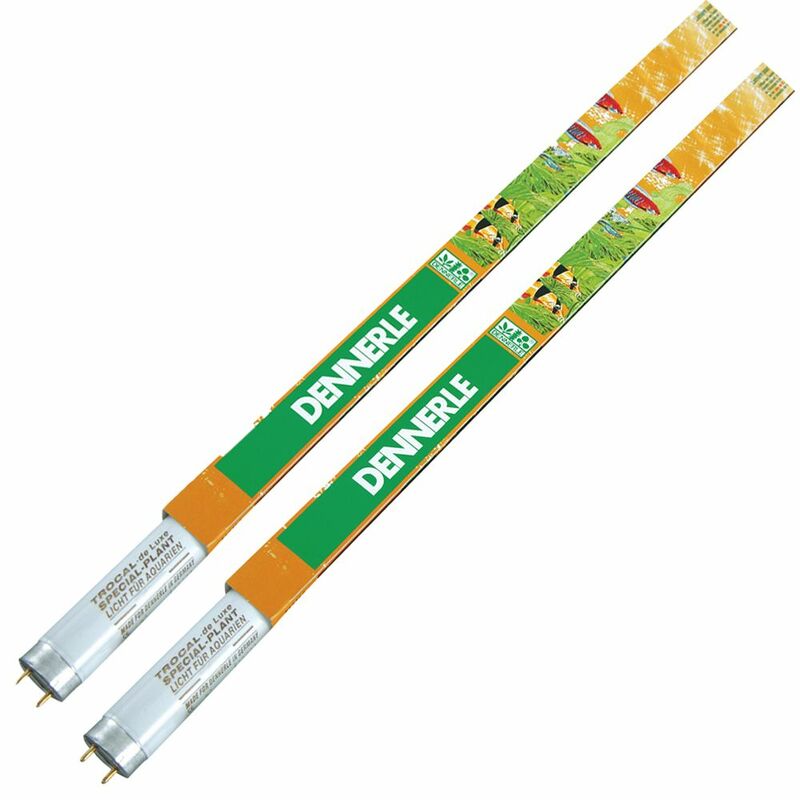 The Best Deals online for Dennerle Trocal de Luxe T8 Special Plant DUO and your essential Pet Supply Products. Order over £29 and get FREE DELIVERY on all orders today. Most orders are processed and dispatched within 24 hours from this supplier (zooplus) and their delivery service partners provide online parcel tracking facilities, active from 2-3 days after dispatch of your Dennerle Trocal de Luxe T8 Special Plant DUO order. The suplier 'zooplus' offers International shipping to the countries listed in the table below for shipping on Dennerle Trocal de Luxe T8 Special Plant DUO. Dennerle Trocal de Luxe T8 Special Plant DUO requires a £2.99 Delivery Fee from the supplier for deliveries within Great Britain. Orders over £29 qualify for Free Delivery. This can be checked using shipping calculator to your post code on the suppliers web site when purchasing.